Editor’s note: Veterans Day honors those who have served in the United States military. Many veterans take up teaching when they return to civilian life. Capt. Chris Lusto served as an artillery officer in the Marine Corps. He was stationed mainly at Camp Pendleton, California, and deployed to Fallujah, Iraq, in 2006, and then with the 11th Marine Expeditionary Unit. Lusto now teaches math at Pleasant Valley High School in Brodheadsville, Pennsylvania. When adults learn that I was a Marine officer before I became a teacher, the first thing I have to do is to answer a series of polite questions about how disorienting the transition must have been. The obvious implication is that these two identities seem so wildly disparate as to be incompatible. And when I say — as I always do — that it’s really not so different, it takes a beat for people to realize I’m not trying to be funny. Students, for their part, tend mainly to be astonished that I would ditch a job that not only allowed but actually required me to explode things, all so I could spend my days talking about algebra. They still see the military world as alien. I shared one memory of my military experience with my students a few years ago. A fellow Marine, Marty, was hunched over a protractor, squinting hard at the angles on his paper and muttering to himself. Another Marine, Ben, takes notice and fires off a smartass remark I didn’t quite catch. When Ben turns his back, Marty throws a half-empty water bottle at him but misjudges — all that squinting, maybe — and leaves it a foot short. Off to my right, another one of the crew, Zach, films the exchange. I look up at them and shake my head. In another memory, we are at the end of a three-day exercise, each of us at a slightly different point in an accelerating nicotine cycle, when the radio interrupts with new targeting info. Everybody hops up. Or hops in. Overcrowding is a constant concern in our makeshift Fire Direction Center — really just a canopy wedged between two Humvees — so we spend a lot of time at its open edges. Facing out, if possible. Today we’re lobbing artillery shells into the black hole at the center of Camp Pendleton in California. We’re preparing to do this again someday soon, somewhere real. Fundamentally, my job as a teacher is the same as when I was in the Marines, but the particulars of military life, especially in the context of two simultaneous and protracted wars, are unimaginable to most. That I could move so readily from that world to this one feels unsettling. The night before Zach shot that video I gave a class out under the stars, assisted by a pair of headlights. Afterward I started back toward my sleeping bag, and, being momentarily blinded, tumbled into an ammunition pit. That sort of hazard is less common these days. A couple years ago, I showed the video to my classes on Veterans Day. It was a big hit. The kids got to see what I looked like at 23. Joking around. Being serious. Happy. Exhausted. Helping people with their work. In other words, they got to see me, pretty much the same guy they shared a room with every day. As the clip went on, my students spent more and more time focused on the Marines themselves. They offered words of solidarity when Marty pressed both palms against his eyes, sore from 72 hours of what amounts to loud, high-stakes geometry homework. They laughed when Zach suddenly turned the camera on himself, thrilled to recognize a human impulse that predates the word selfie. I looked at them thinking that a lot of Marines are not much older than high school kids. Zach’s video is ten-years old now. And I live a half-hour from where I grew up and teach math in the same building where I learned a good bit of it. 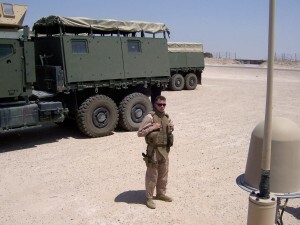 Left: Captain Chris Lusto, United States Marine Corps, Al Taqaddum Air Base in Iraq, 2006.